Meet the handsome Dexter, a 3-year-old German Shepherd who came into Uni Vets Camden to visit Dr Tina Baxter about his itchy skin. Dexter has suffered from allergic skin disease for most of his life. Like many dogs, the cause of his allergy was thought to be something ‘in the air’; similar to hay fever that humans experience. This condition is called atopic dermatitis. To try to work out which airborne substances Dexter is allergic to, he underwent intradermal allergy testing with Dr Tina. This procedure involved sedating him and giving 61 small injections just under his skin. This allowed us to test for skin reactions to a large spectrum of environmental allergens, such as dust mites, pollens from trees, weeds and grasses, moulds and insects. 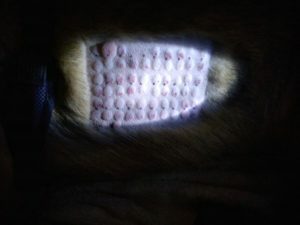 After about 10 minutes, the injection sites were measured under bright light. In the picture, you can see that Dexter reacted to a few allergens, including fleas, and dust mites. Dexter was a very brave boy and the results of this test gave important information to Dr Tina and his owner, to help focus his treatment plan in the future. Like in human medicine, Dexter can get immunotherapy to desensitise him to these allergens over time. The substances (pollens, dust mites, insects or moulds) he reacted to in the allergy test are concentrated into a liquid (we call it an ‘allergy vaccine’) and he is given an injection of this regularly. This idea is to ‘teach’ his body to learn to cope with the substances, and his owner can give the injections at home. Allergy vaccines are one of the many options to treat allergic pets, and demonstrate how advances in veterinary medicine can help our furry friends live healthier, happier lives! By Caroline Hoetzer, final year Doctor of Veterinary Medicine student, The University of Sydney.